Reservations required. Seating is first-come, first-served. Are the police out of control? What happened to “innocent until proven guilty”? Is Malcolm’s neighbor Luis (an undocumented immigrant,) actually a SNORF-lord? And can Malcolm convince his grandson that it is safer to re-up and fight overseas than to try to survive here at home, in Freedomland? 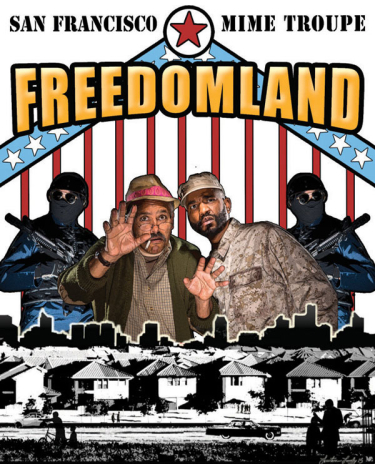 In the current climate of “Black Lives Matter” and local and national conversations about race, we are fortunate that the San Francisco Mime Troupe is set to perform FREEDOMLAND at SMCM. Lauded as one of the finest agit-prop performance troupes in the world, the San Francisco Mime Troupe is theater of political satire, rooted in the performance traditions of commedia dell’arte (16th c. Italian street theater), broad farce, and melodrama. 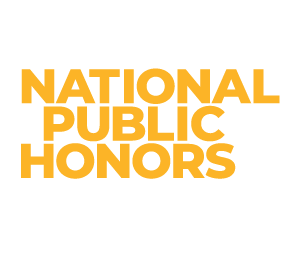 Since its inception 57 years ago (1959), the Troupe has performed its socially conscious theater worldwide to critical and popular acclaim. The Department of Theater, Film, and Media Studies would like to thank the Office of the President, the Office of Student Affairs, SGA, Lecture and Fine Arts, Arts Alliance, the African & African Diaspora Studies program, and The Center for the Study of Democracy for their generous support of the residency of the San Francisco Mime Troupe. Performances of FREEDOMLAND are FREE and open to the public. Reservations required. You MUST have a ticket to get into the event. Seating is first-come, first-served. To reserve tickets, contact the Theater Box Office at 240-895-4243 (ext. 4243), or email boxoffice@smcm.edu. Please check back periodically for updates about reservations for performances of FREEDOMLAND.